As a nut roast enthusiast, I have made many nut roasts in my time but I have struggled to find a good basic vegan nut roast recipe. Often I find vegan nut roasts either too soft or too fiddly. 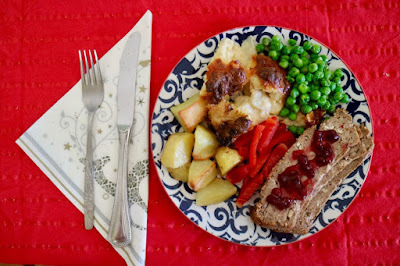 The recipe today is a quick and simple nut roast that holds together well. I have also included a couple of other recipes for fudge and spiced nuts that could be whipped up for festive gifts or entertaining. Christmas is tiring enough without complicated recipes. 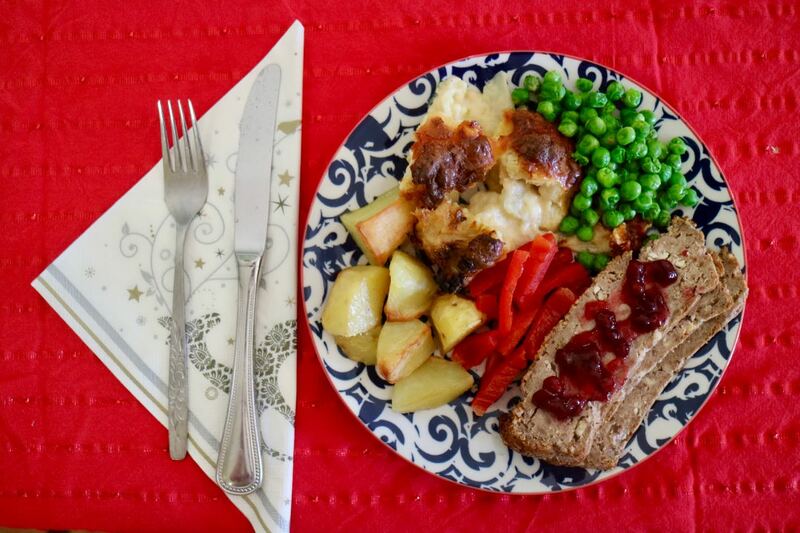 But first, nut roast! 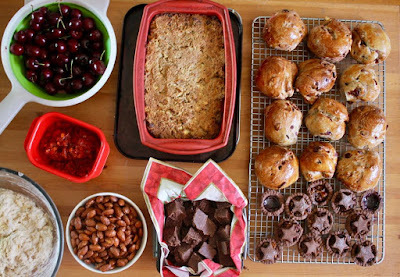 I made this a few days before Christmas because I have too many nuts stashed away in the freezer and this seemed easy. 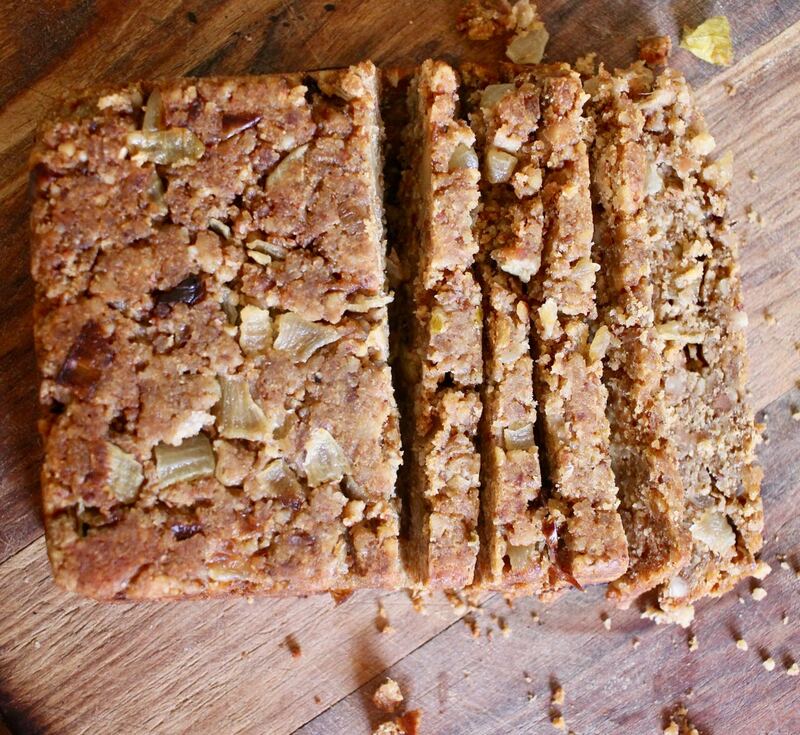 I have made this nut roast a couple of other times with variations but I wanted to make it plain so that I could have it here as a template for other variations. I took a photo below with some flowers I was given at work. 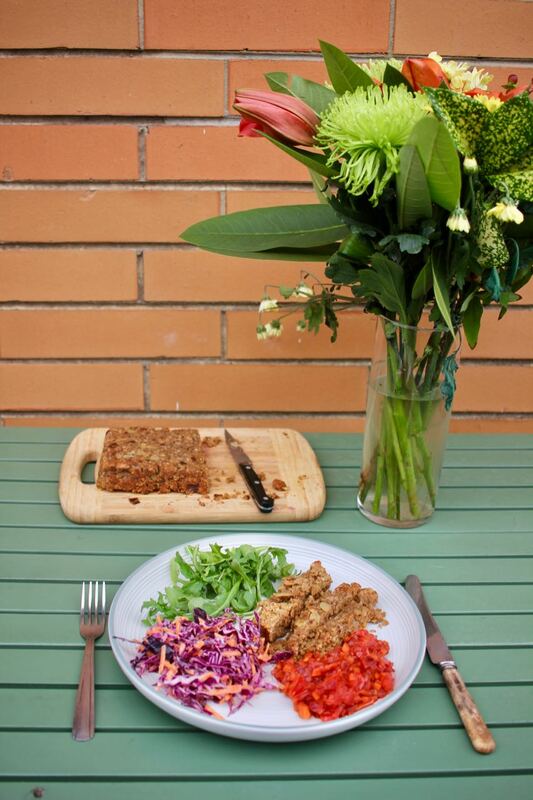 Once I had the nut roast together I made a tomato sauce that used up cherry tomatoes, carrots and wine. I also used up cabbage and more carrots for colelsaw. I even tried to rescue some pumpkin by roasting it but foolishly did not use the time and ended up burning it. My fridge crisper really needed a good clear out. Sadly some stuff was only good for the worm farm. Still, it was a fine meal to eat while watching How the Grinch Stole Christmas. I've got into the habit of making pizza on Christmas Eve, mostly because it is one of my easy meals. 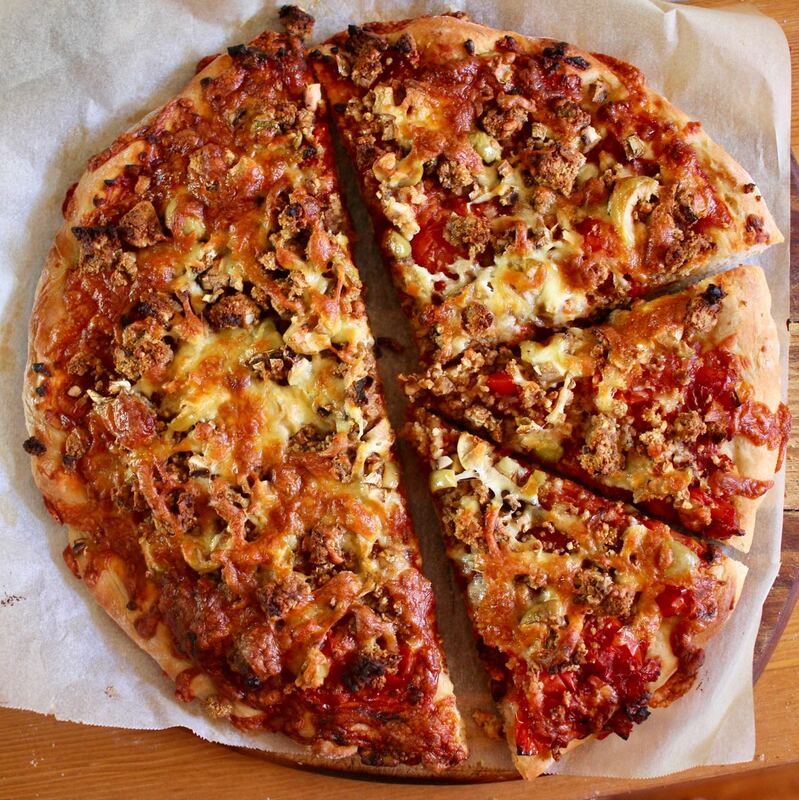 Part of my plan in making nut roast was to have leftovers to crumble over pizza. 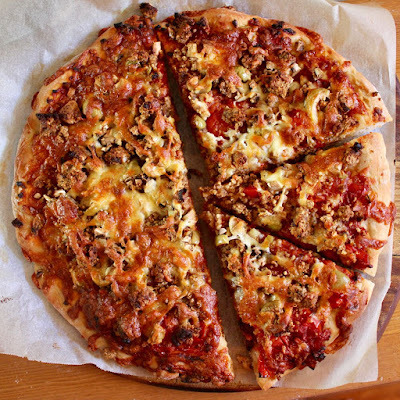 This pizza was most excellent with leftover tomato sauce, nut roast, marinated olives, mushroom and cheese. In keeping with the theme of easy and frugal, I had decided to make spiced nuts. This was inspired by deciding to make chocolate mince pies (after being persuaded by Sylvia that Santa really loves our recipe which is unlike anyone else's). If I made the pastry with an egg yolk I had a leftover egg white so this was what was needed for Cakelaw's Spiced Christmas Nuts. Ironically I forgot the egg yolk and didn't really need to make the recipe but was curious. Then I tweaked the spices for less heat and varied the proportions. I also baked them at the bottom of the oven which was too hot. So all in all they weren't quite as tasty as I had hoped and I didn't get the desired roasted crunch. They were nice but needed more attention. Nevertheless I liked them enough to take to Christmas day dinner and share. They were good nibbles to have on the table with my sister's platter while we opened presents. However I think I might be putting the rest into salads or baking. And I must try again because I like the idea (hence my sharing of it here). 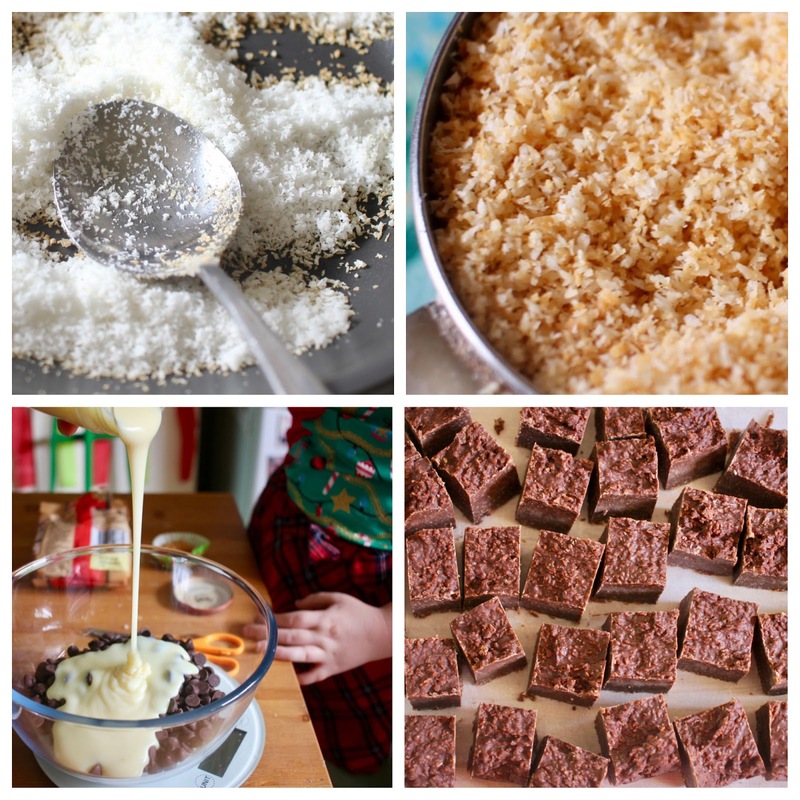 More of a success in using up leftovers was the coconut rough fudge. I was about to buy coconut rough chocolate when I decided to try make a fudge with leftover condensed milk from my Bailey's biscuit fudge and that extra bag of choc chips I had bought by mistake when I forgot I already had one. Although I wanted more coconut, others assured me it was just fine. And this was most excellent. Though how can you go wrong with chocolate, condensed milk and coconut! I might have taken a photo in Geelong over Christmas but it went too soon. Firstly I put it out with Christmas dessert because I knew a few of the family would appreciate it. The fudge went down very well. The my mum put it out on Boxing Day when E and I were watching Star Wars at the cinema. When we came home there were 2 pieces left. I certainly can't complain when everyone loves my fudge. 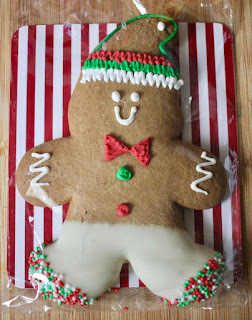 And it is too late for you to make these for this Christmas but it is not too late to make them for New Year's Eve. As this will be my last post this year, I wish you a very Happy New Year's Eve and will be back soon with my round up of 2017. Fry onion in oil. Mix with nuts, almonds, breadcrumbs, and herbs and spices. Mix vegemite into hot water and add to mixture. Season. Scrape into a greased and lined loaf tin. Smooth top with the back of a spoon. Bake at 180 C for 30 minutes or until golden brown and firm to touch. NOTES: There are many variations to this nut roast. This time I used 1 tsp olive oil and 1 tsp truffle oil that I added after frying. 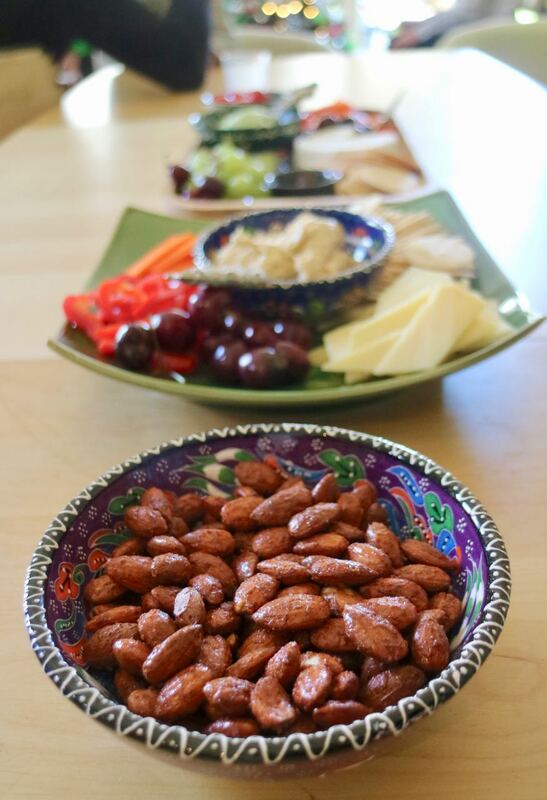 The mixed nuts can be any combination - almond and cashew work well. I blend mine until they are part ground and part very finely chopped as I think the ground nuts help hold it together. I used 1 tsp dried sage, 1 tsp seeded mustard and would have used 1 tsp smoked paprika (but it was lost so I used 1 tsp seasoning mix which was probably a bit much seasoning but I got away with it.) If you don't have vegemite or yeast extract you could use stock power or extra seasoning. Toast coconut on dry frypan until it turns light golden brown (it will change colour quickly so stir constantly). Set aside. Melt choc chips and condensed milk together. I do this in a heat proof bowl in the microwave, 30 seconds at a time but it could be done on the stovetop over low heat. Stir in toasted coconut. 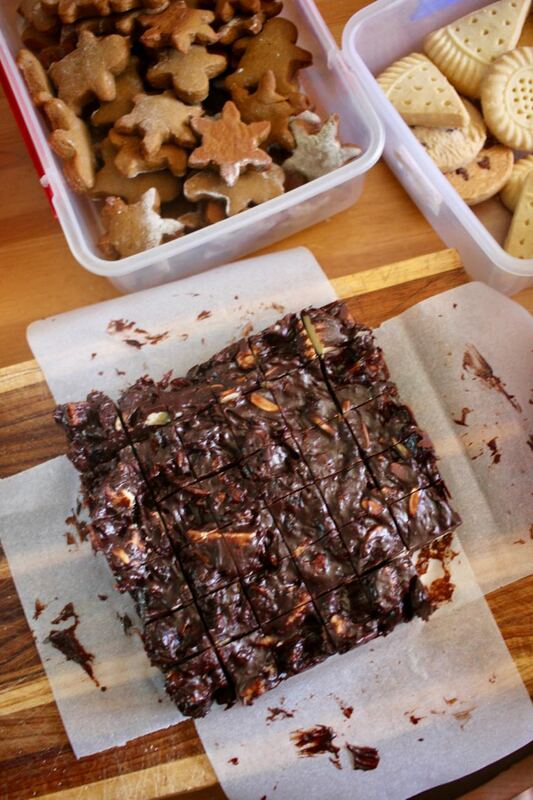 Spread in lined tin (I used a 20cm square tin but only used about 2/3 of it but the fudge is stiff enough to stop it spreading over the whole tin). Leave in fridge overnight or for 4-6 hours to firm up and then slice into small pieces. 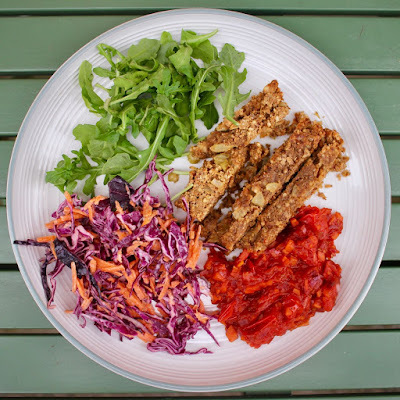 NOTES: I used desiccated coconut but would like to try shredded coconut (like in Create, Bake, Make) for more texture - though I was told by others that desiccated coconut was just right. I used dark choc chips because it is quite sweet with the condensed milk but you could make it richer by using a good 70% chocolate or sweeter by using milk choc chips. You could sprinkle the fudge with more coconut but I forgot about this til it was set. To make it vegan use a vegan chocolate and a coconut condensed milk. Mix all ingredients in a medium to large mixing bowl adding the nuts last. Line a large roasting tin with baking paper and roast at 160 C for 15-20 minutes. 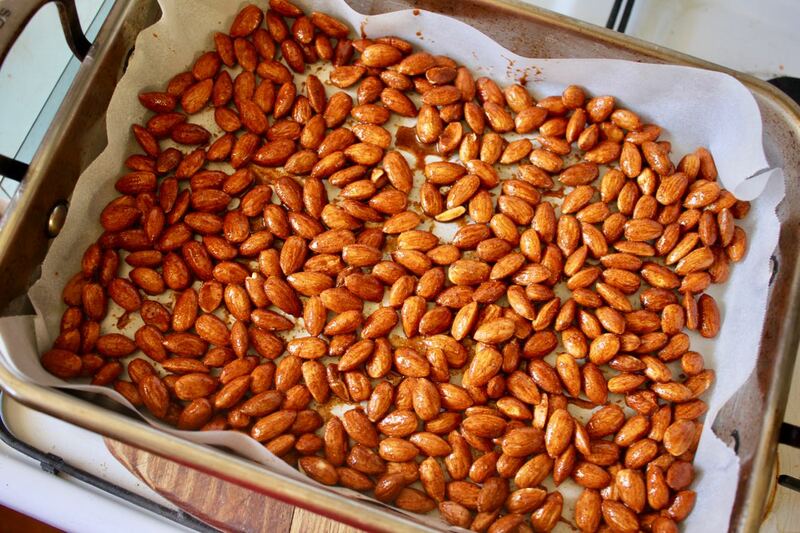 Nuts will crisp up as they cool. NOTES: I used almonds but mixed or other nuts would work too. 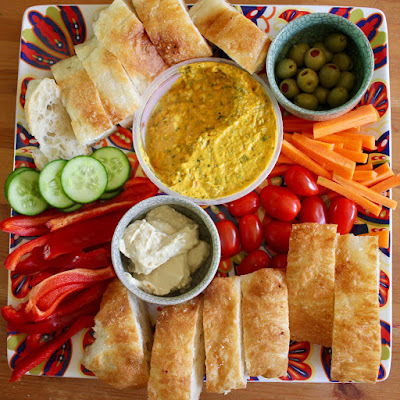 I would like to try this recipe with aquafaba to make it vegan. I found the spices and sugar weren't as prominent as I had hoped - probably because I reduced them - so I would increase (double?) these next time. Christmas has come and gone. I hope you had a good one. We are now in the week of sleep-ins, movies and festive leftovers. Here is a little recap of our Christmas. 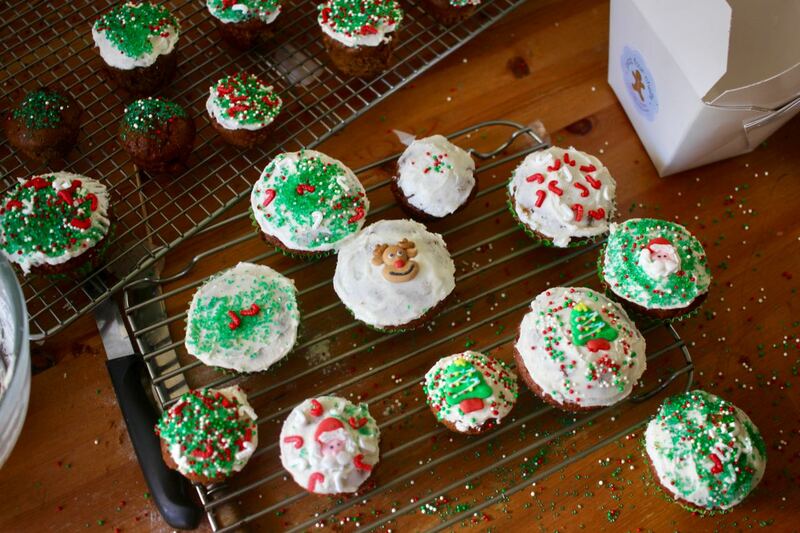 Christmas eve was a day of baking, as usual. After a really busy time, it was great to get in the kitchen and bake up a storm. At the end of the night the table heaved under nut roast, cranberry nut rolls, chocolate mince pies, panforte, pizza, spiced nuts and fudge. Biggest disaster was when I was about to put the panforte in the oven and saw the figs were still on the chopping board! 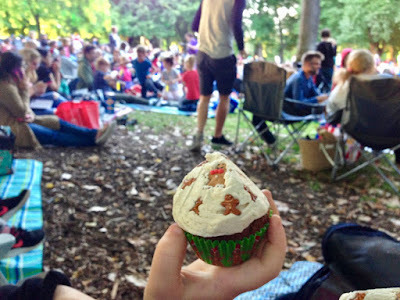 Which I guess is why I shouldn't leave it til I am watching Carols by Candlelight after dinner. 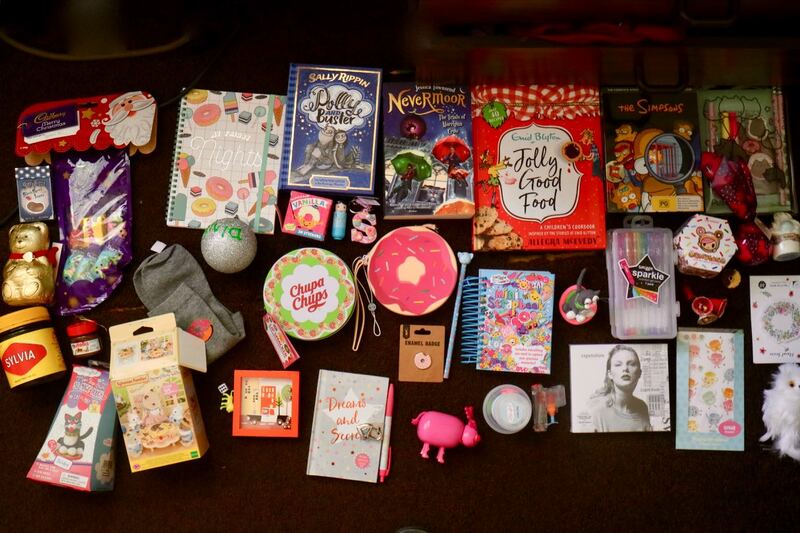 A few of the recipes to come soon. Did I mention I now have 5 weeks leave. Woo hoo! I live in hope of more time for blogging. Christmas day began ridiculously early. Sylvia came in to tell me about what Santa had bought her at 2am (in our family Santa does not wrap presents). I was so tired I turned over and tried to ignore her gasping at how spicy a Harry Potter Bertie Bott's black pepper jelly bean was. E finally coaxed her back to bed and sleep. Above is the Pink Super Dooper Pooper that poops jelly beans. Sylvia was really excited by this present. 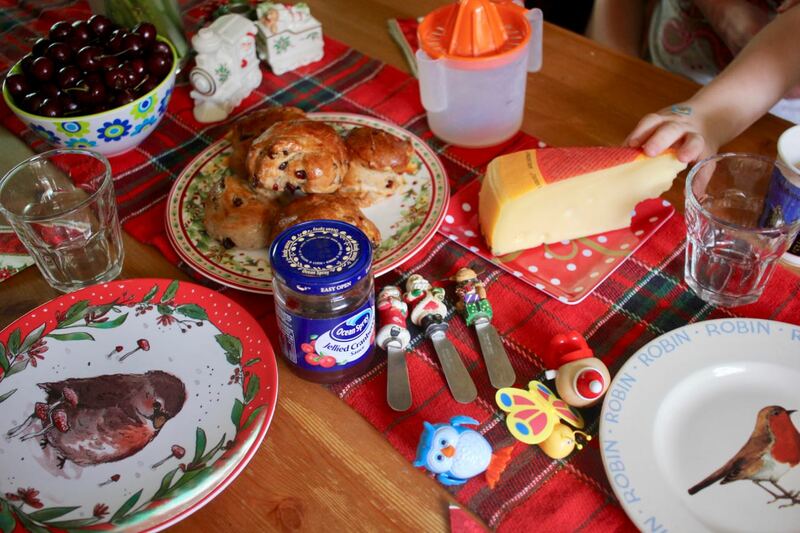 We rose at a more civilised time (7.30am) to open the presents under the tree and eat cranberry nut rolls, Jarlsberg cheese and orange juice. 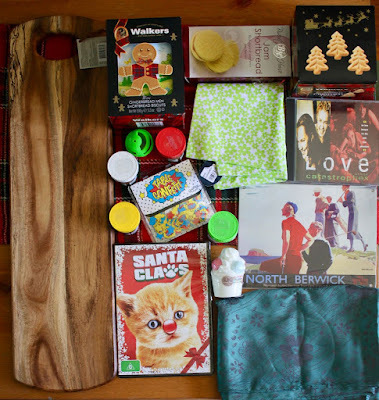 Then we headed down to Geelong to my parents for more presents and Christmas dinner. 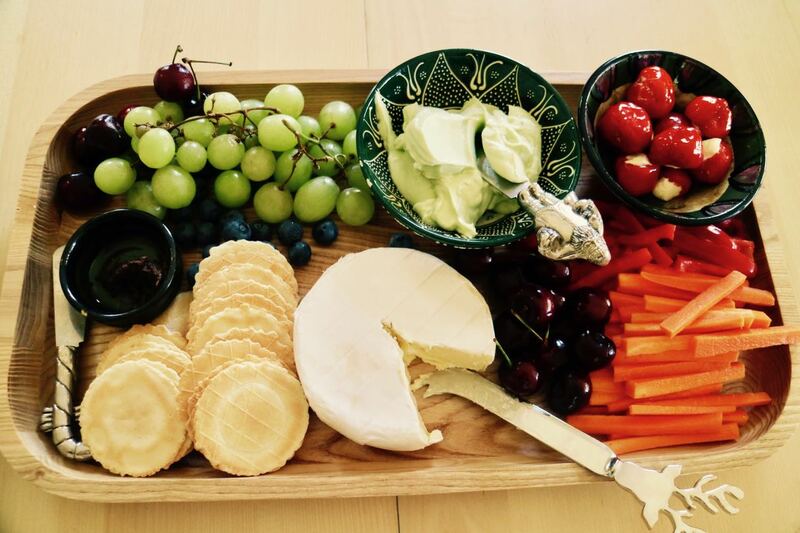 My sister put together a fantastic platter of cheese, crackers and veg to keep us going because Christmas dinner is later than our usual lunch time. The kids were happy to play Harry Potter Cluedo while they waited. 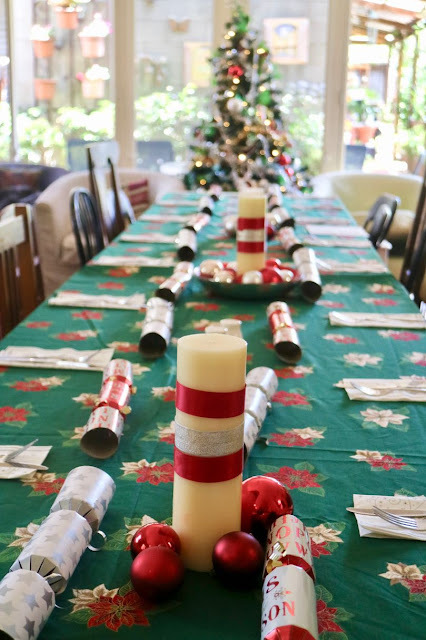 I forgot to take a photo of my Christmas lunch but I did take one on Boxing Day when my mum had enough leftovers (almost) for another Christmas dinner with my dad's family. My mum had to roast more potato (you can never roast too much potato) and I had red pepper instead of roast pumpkin. I loved my sister's cauliflower cheese - it was worth her finding a place where she could buy cauliflower on Christmas morning. I went traditional with pudding and custard for dessert. 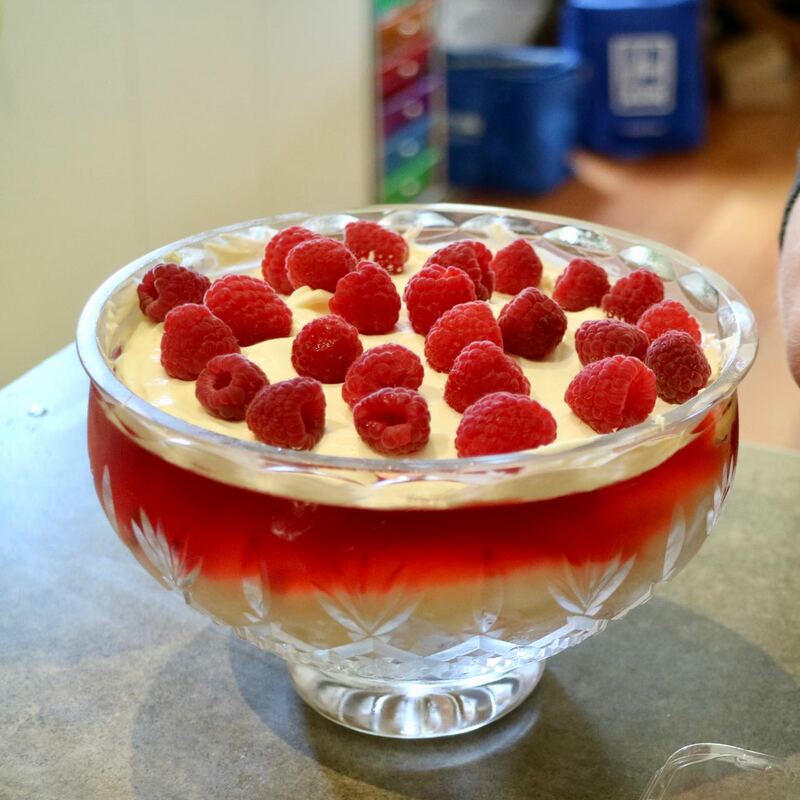 The trifle looked wonderful but I didn't actually get a taste. Nor dd I partake of pavlova. 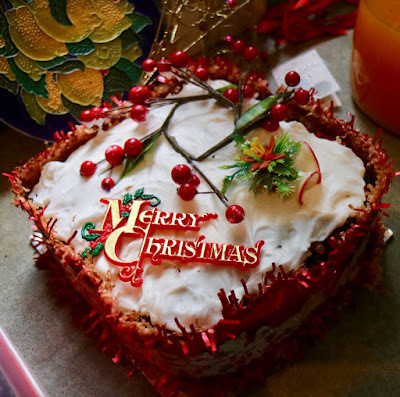 She also forgot to put our my panforte on Boxing Day but that was ok because my Aunt Jacqui was not there this year (and she is the biggest fan of my panforte). And most importantly, mum saved me a piece of caramel tart on boxing day when E and I went to see Star Wars The Last Jedi during dessert. We had a relaxing afternoon. 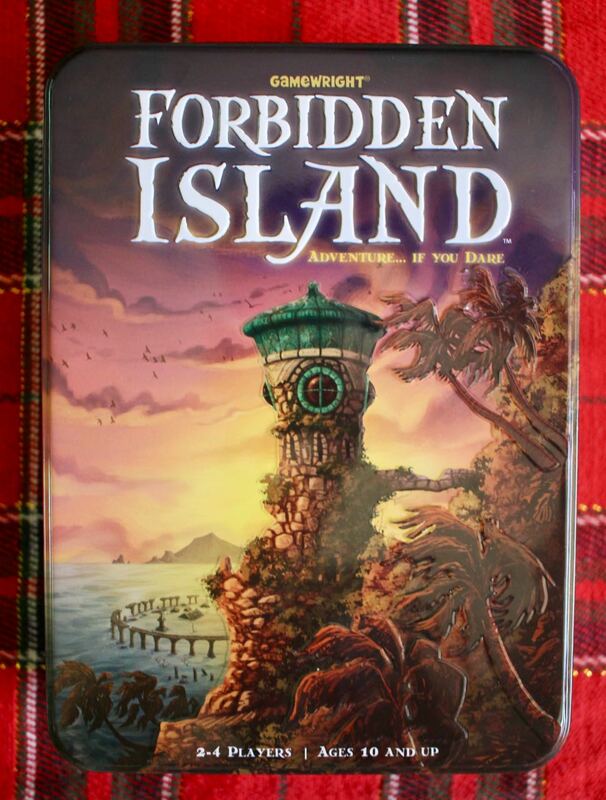 I bought E this Forbidden Island game. It was fun and interesting to play a game that was cooperative rather than competitive. 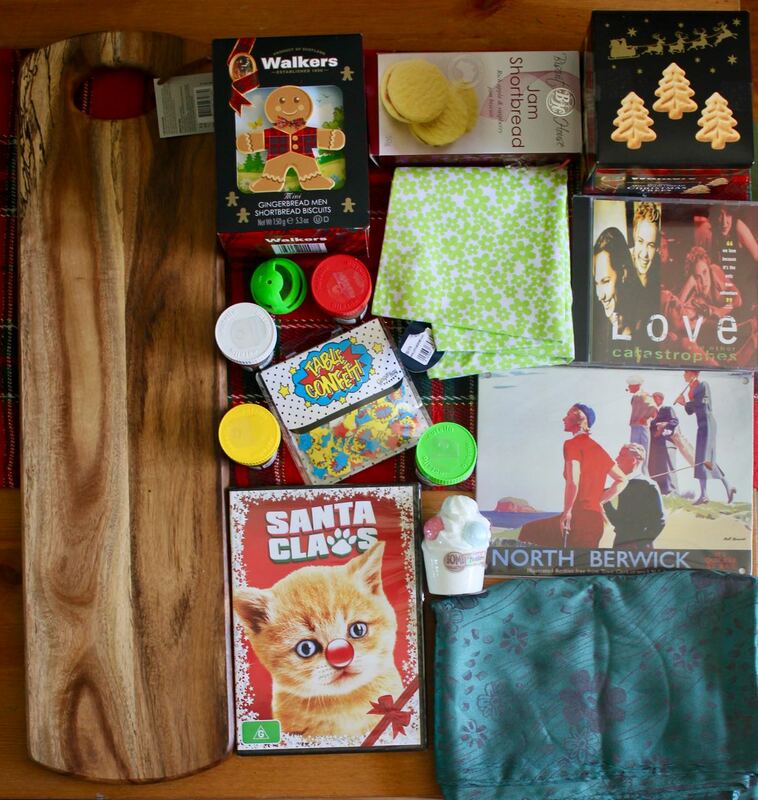 Sylvia got heaps of presents. Too many to fit in one photo. There is also a 1000 piece jigsaw and a few other bits of pieces that did not make the photo. E and I got less presents but lots of interesting things. Table confetti, anyone? Plus a few books. Always books. And we received lots of food. I am especially fond of the skull jar of hot sauce. Yesterday we were back home and it was 36 C. So Sylvia and I went out to enjoy some air conditioning at the movies. We went to see Paddington 2, which was excellent at the Crown Complex, which annoys me. 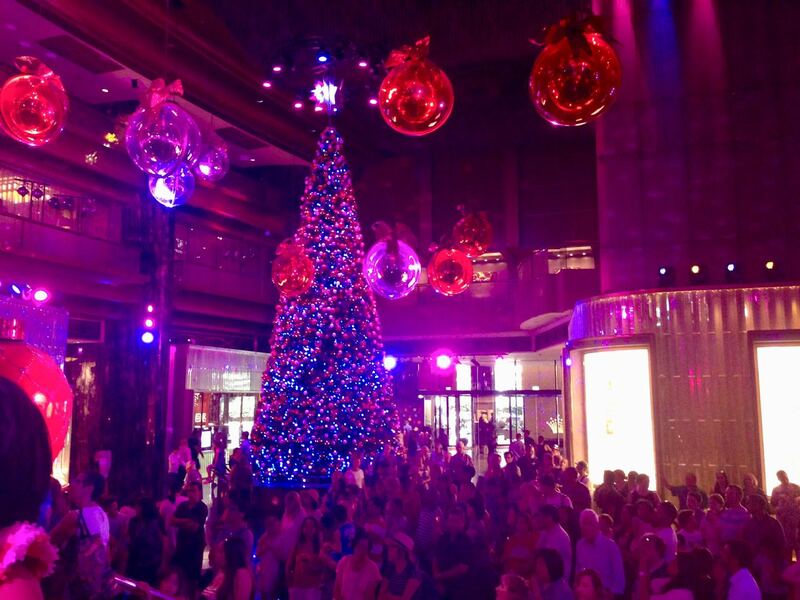 But Crown does do a pretty amazing Christmas light and sound show. Sylvia loved it with all the faberge eggs opening to different Christmas songs and the lights going crazy on a huge Christmas tree. Finally I have finished my Christmas baking, Sylvia is in bed and I can relax in front of the Carols by Candlelight on the telly and share one last post before Christmas to show off some of Melbourne (and Geelong's) fantastic festive offerings. 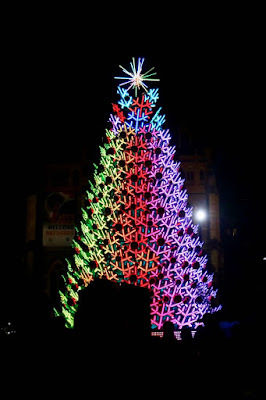 We have been going to see Geelong Christmas lights on Christmas night each year for the last few years but this year we went earlier as this suited my dad better. He is always part of the trip and so we went with him and my niece Ashy. Ashy and Sylvia really loved listing the lights. 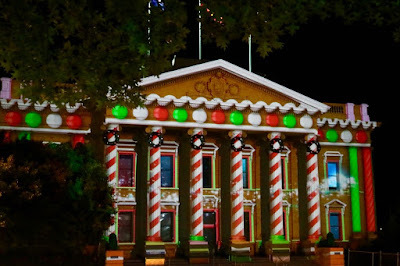 The lights at Geelong Town Hall were slightly different but fun all the same. This week we had two late nights out with Sylvia. Firstly we went to the city on Wednesday night to see the sights. We started with Lord of the Fries burger and fries at Fed Square. 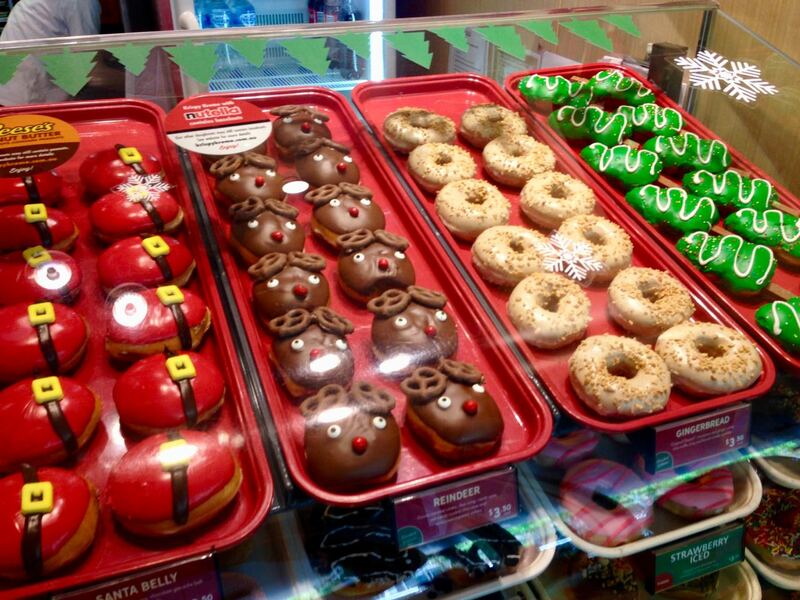 Then headed off for a doughnut. I really wanted to check out the Doughnut Time Christmas selection but they had closed. 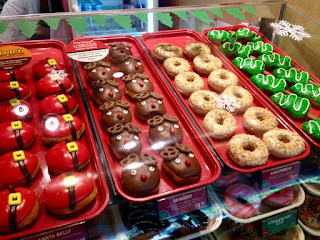 Krrispy Kreme (above) ran out of their Christmas doughnuts. So we had Ben and Jerry's ice cream. Sylvia had part of mine because after a taster of the sweet cream and cookies, she chose it and then decided she didn't like it. My new york fudge was excellent. It seems we were later than usual on our Christmas city trip. 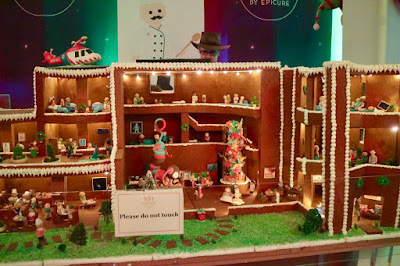 So we hurried along to the Gingerbread village at the Melbourne Town Hall. We arrived just before the security guard put the sign up to say they were not taking any more people. I felt sorry for the guy who had to disappoint lots of little kids by telling them they could not come in. He was actually a really nice guy. And we felt really lucky to have just got in to the queue rather than resenting having to wait 10-15 minutes to get in. I really enjoyed the village this year. 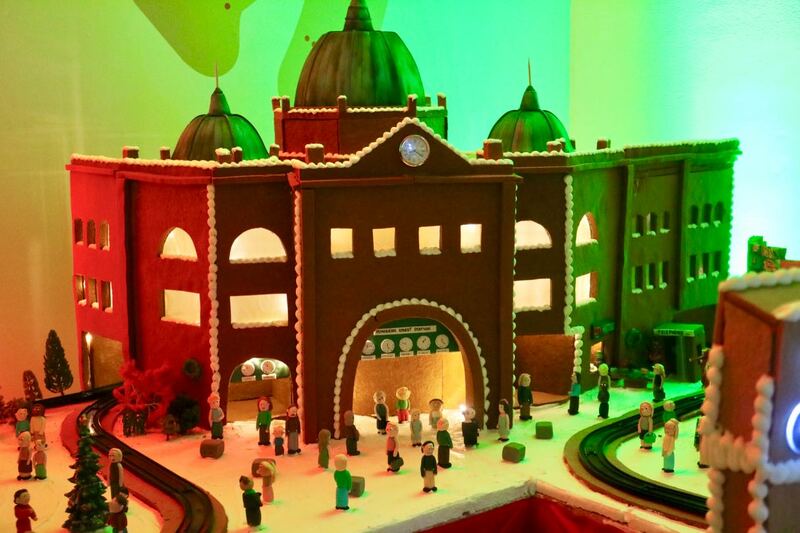 It is made up on iconic Melbourne buildings made of gingerbread. There were more icons this year than on my last visit. Above is the MCG and further up is Flinders Street Station. 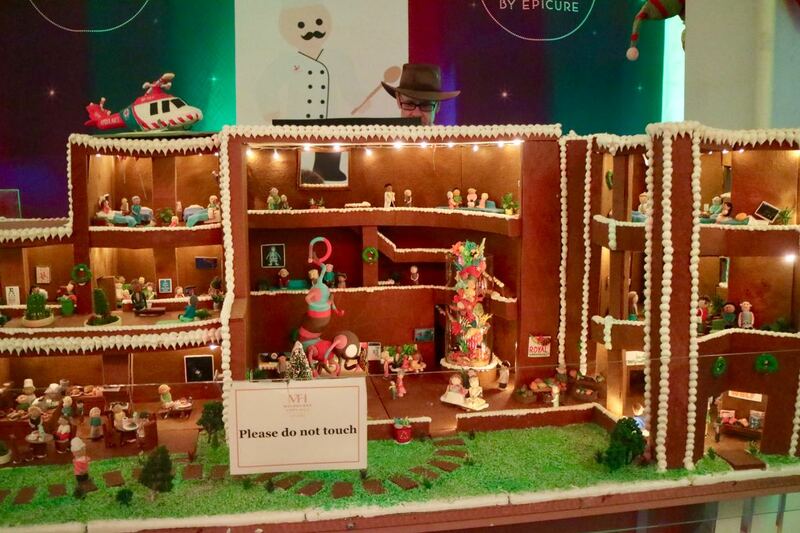 There were also some really great attention to detail. Sylvia was very excited about the doughnut stall. 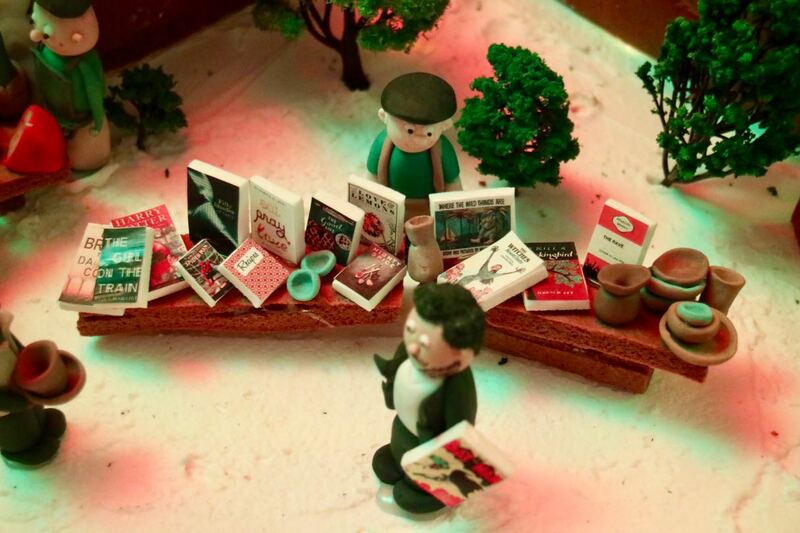 And we all had fun spotting book titles on this bookstall. Federation Square made an appearance which Sylvia enjoyed because we had just been there. My favourite building was the Royal Children's Hospital. So much detail. And as Sylvia and I have been there quite a few times, we recognised quite a few places. The aquarium, the odd pink and blue figure in the foyer and or course the meerkats. I really wanted to stay for much longer than we had. Then we headed to Myer where Sylvia swallowed her disappointments bravely. 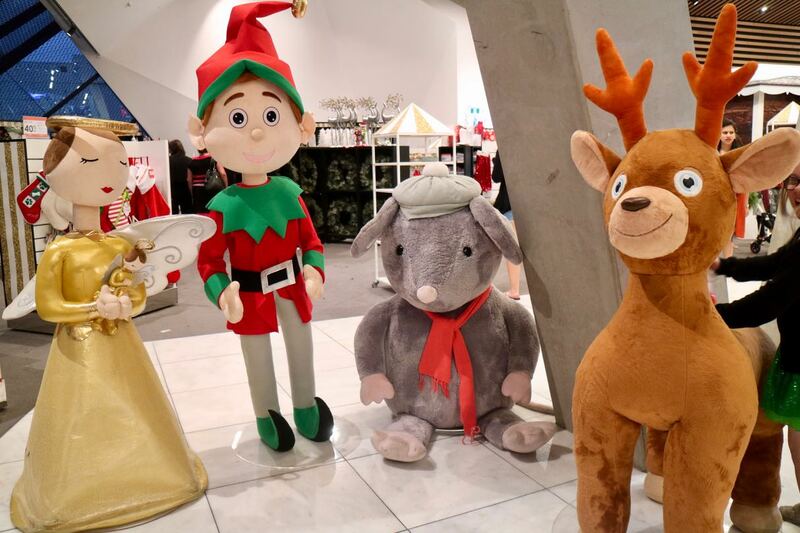 It was after 8.30pm and there were still huge queues at the Myer Christmas Windows so we gave them a miss. 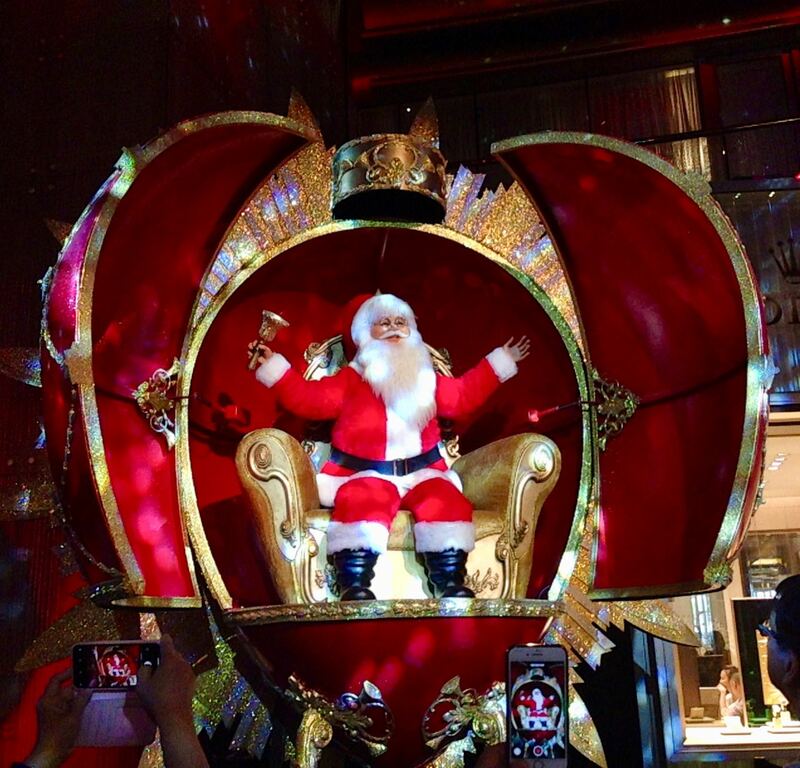 Then Santa gave us a miss because he had already gone by the time we arrived. So we headed back to Fed Square. 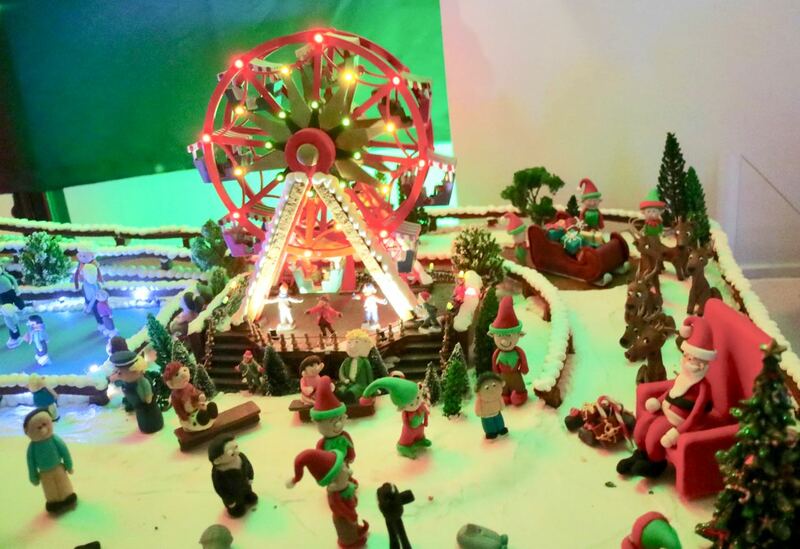 The City Square, where the Christmas Village is usually located, has closed for extension to our underground railway. 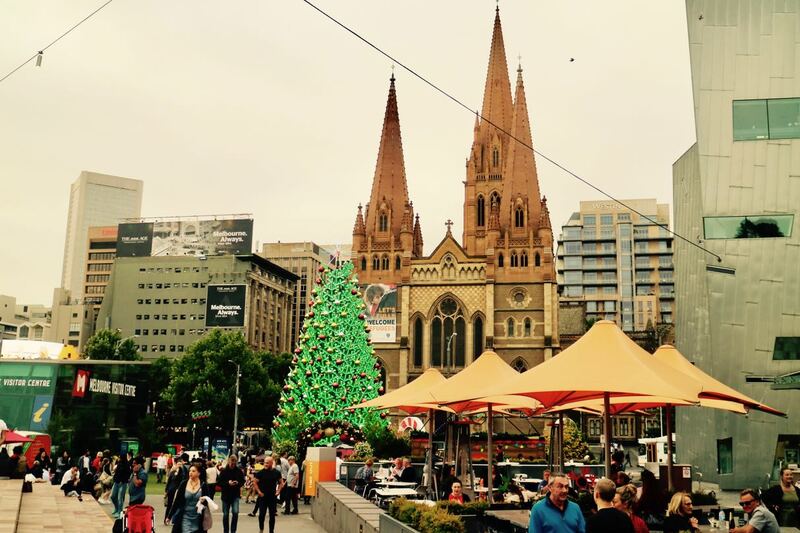 So the Christmas Village is now in Fed Square. It is so much better there. 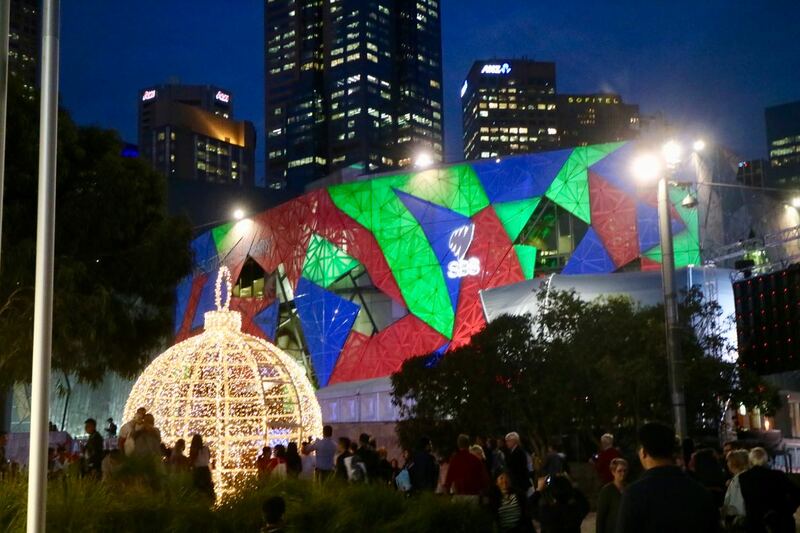 Fed Square is the community hub that the City Square never managed to be. So now the Christmas village is incorporated into the crowds that are attracted to Fed Square and has a great light show. The above photos was taken earlier in the night. And this photos was taken weeks earlier when Sylvia and I were in the city and she got to visit Santa in Fed Square on this visit. 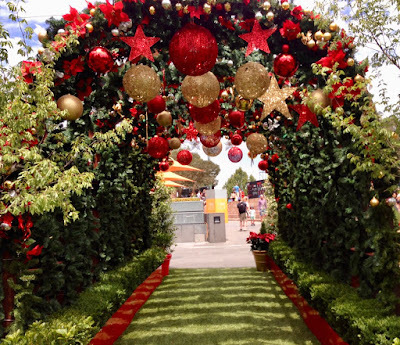 The archway of baubles and stars was really popular for photos both during daylight and when it was lit up at night. So it was quite an achievement to get this photo with no one in it. The huge Christmas bauble was a great crowd pleaser - it was fun to walk inside and take photos. Hard to get near and take a photo without the crowd around it. But it is fine to share. It is Christmas after all! 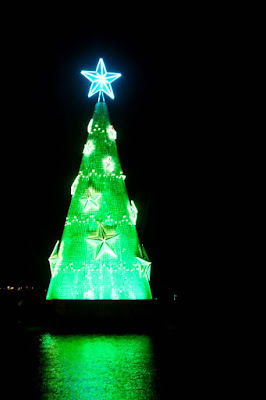 The Christmas tree was light up and had a light show at regular intervals. Someone had put a sign in front of it and I sat where Sylvia chose rather than where I could get a clear photo. 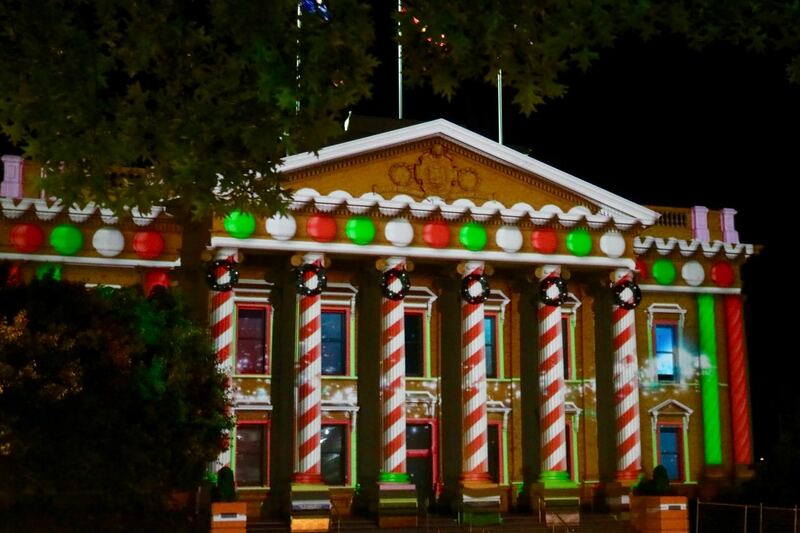 I loved how where we sat we could watch the tree light show and then the light show on the building. 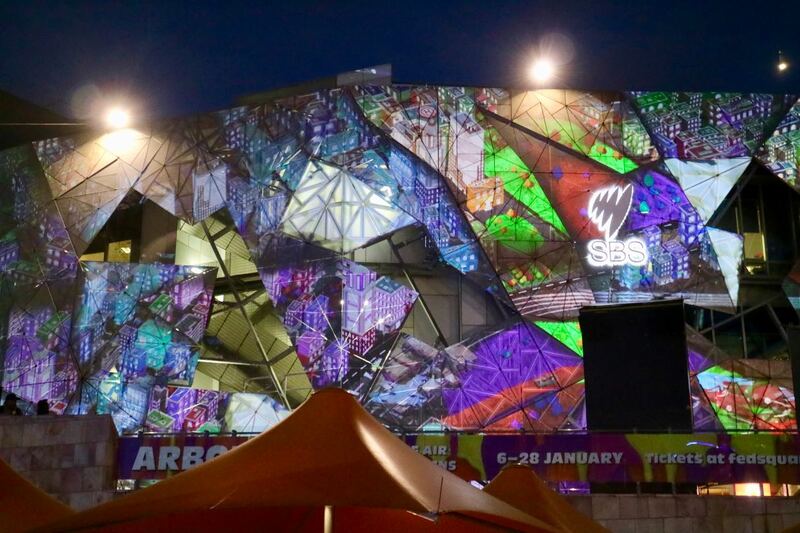 Here is the light show on the Fed Square building. The odd shapes on the building made it a bit of a challenge to see the pictures but it was a fun story about Santa making and delivering presents. Lots of graphics of racing past buildings. 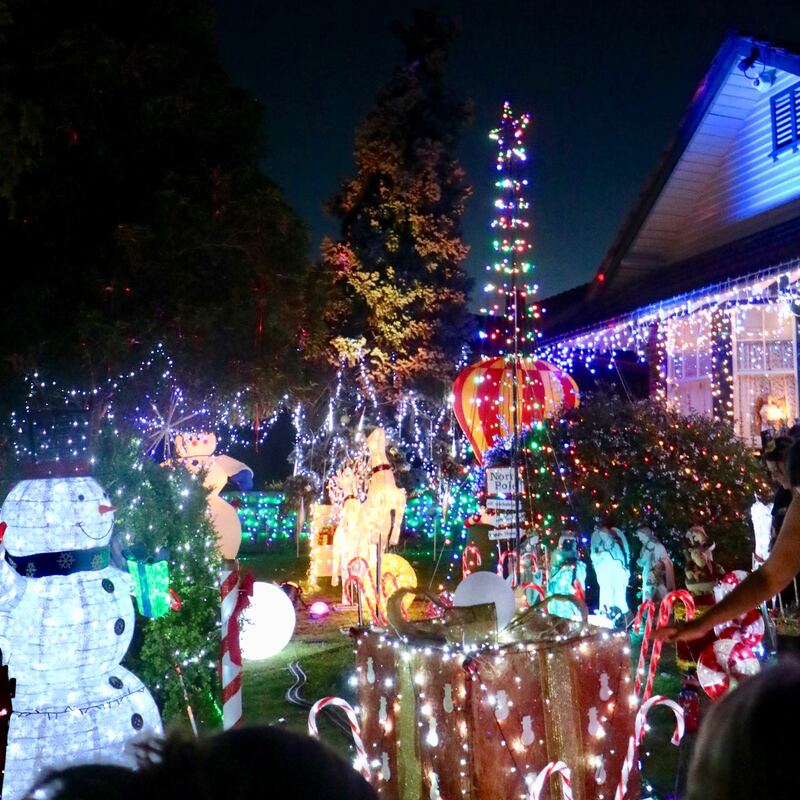 And on Friday we drove around to look at lights on the local houses. This house was amazing and by far the best we saw. I hope you have your festivities organised or just about. (And if you don't celebrate, I wish you a relaxing day tomorrow or at least respite from the Christmas songs in the stores.) 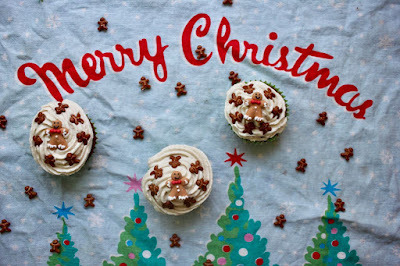 And I wish you and yours a Merry Christmas with lots of good food and good company. We are off to share Christmas dinner with family tomorrow. Meanwhile Carols has almost finished and I still need to wrap some presents. 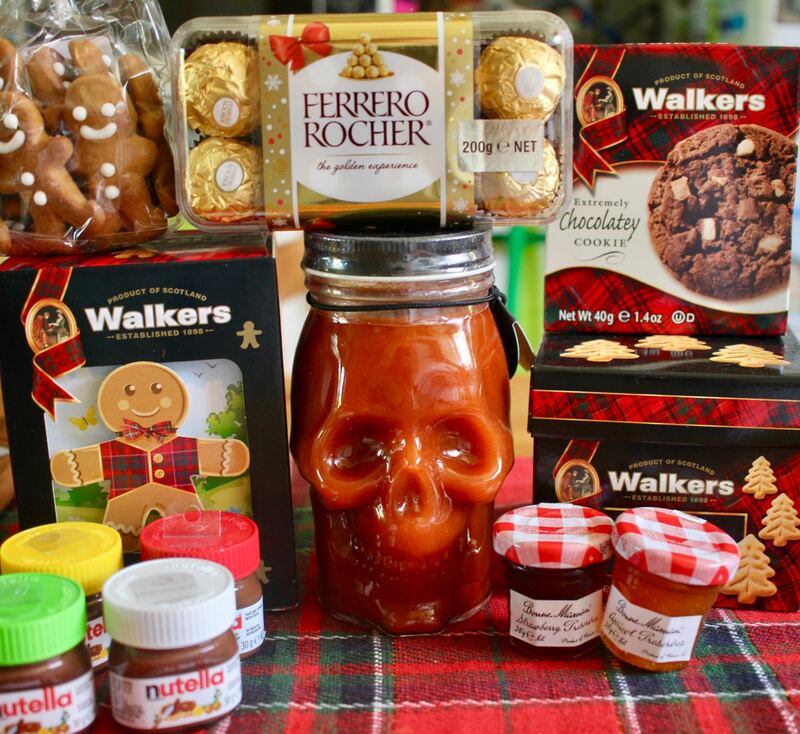 Back soon to share some Christmas food. We had a neighbour over for Baileys when Sylvia had a sleepover at her gymnastics club last weekend. It had been a long time since we drank any Baileys. The bottle has sat there for months and often I am not in the mood or just forget. So when I wanted to make something for our last group meeting at work for the year, I decided it must have Baileys in it. I wanted to make Baileys brownies but all the dense fudgy brownie recipes didn't have liquid in them. So I settled on a biscuit fudge - a riff on the unbaked chocolate slice with biscuits in it variously known as hedgehog, fridge cake, tiffin and other such inscrutable names. It suited me to make an easy no bake slice that could be made quickly after I baked a batch of gingerbread for Sylvia's class party. It would have suited me not to turn the oven on at all after a 36 C day but there were orders to be fulfilled. 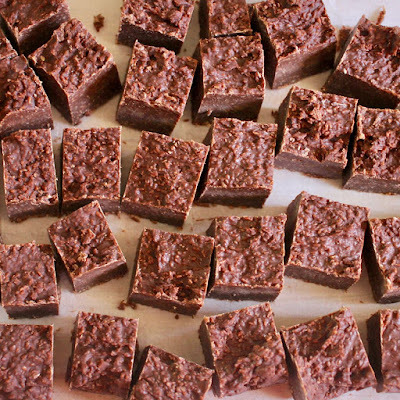 I cut the fudge into small bites the next morning and we ate it after the meeting. It was meant not just as a Christmas treat but also as a thank you to the fantastic people I work with who were willing to go out of their way to help with some busy events last week. 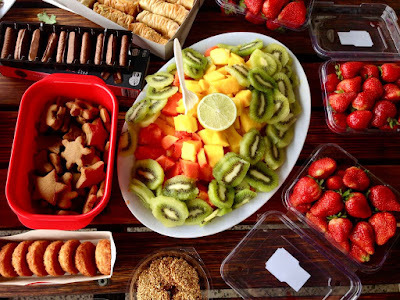 It is great to have a group of adults who will readily eat such treats as I can't make it for most groups in my life because it is not kid-friendly. They are such nice people that they all told me how much they loved the fudge. It was quite rich and a little alcoholic but one of my colleagues was surprised later to hear it had any alcohol in it. So it is for adults, but will suit the faint of heart. And I have some photos to share that I will tag onto this post. 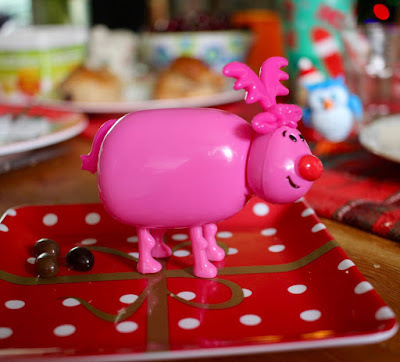 Firstly are a few I took of our group christmas lunch. We went barefoot bowling at one of the local bowling clubs (that is bowls not ten pen bowling). 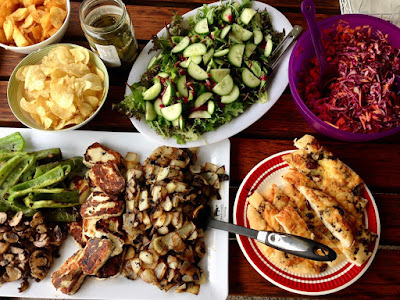 I was sad that at the meal, we also farewelled the only other vegetarian in the group but at least we still have some foodies left who love to discuss all sorts of food and baking. The vegetarian offerings were great with lots of salad and barbecued vegies as well as haloumi and vegie burgers. We had a bowls tournament before dessert. My partner and I had a game plan to get to the dessert table as soon as possible. (That means we played really badly.) It was lots of fun and dessert was excellent too. 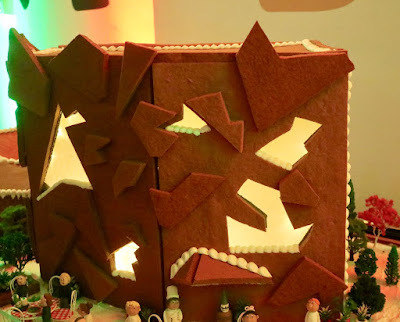 I took along gingerbread. We also had baklava and chocolate wafers and lots of fruit. I didn't take any photos of the food at our back-to-back work events the week before. 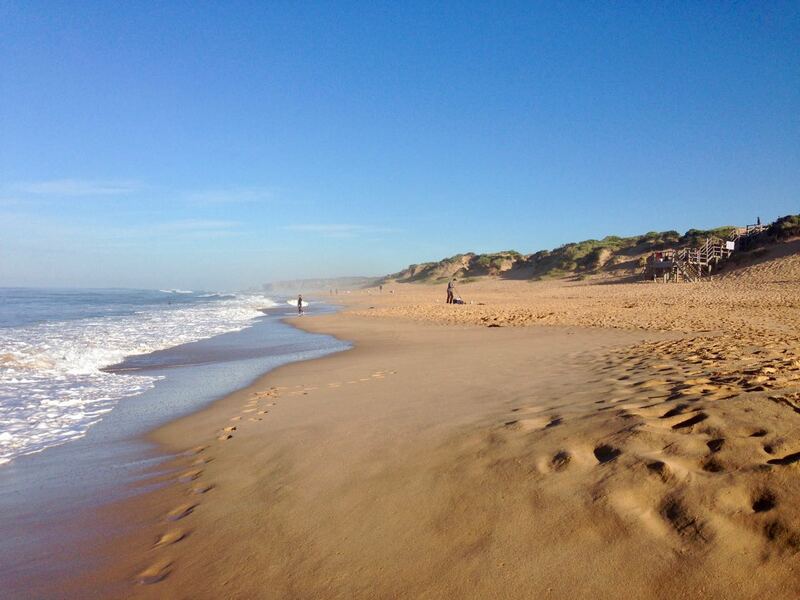 So instead I will share a photo of nearby Gunnamatta Beach. This is the beach that was too scary for us kids to swim in when we were little and I still have an instinctive fear of it and would only wade in the tide. Just in case you think I am exaggerating, it is 50 years on the weekend since we lost Australian Prime Minster, Harold Holt in Cheviot Beach just up the Mornington Peninsula and his body was never found. Fortunately the food was less scary. Generally it was pretty good with lots of salads, arancini balls and lamingtons. I did learn that when you order a vegetarian meal at a sit down dinner, it is best not to go off talking to colleagues on the other side of the room. And I managed to be on a table the came 2nd in the trivia quiz. 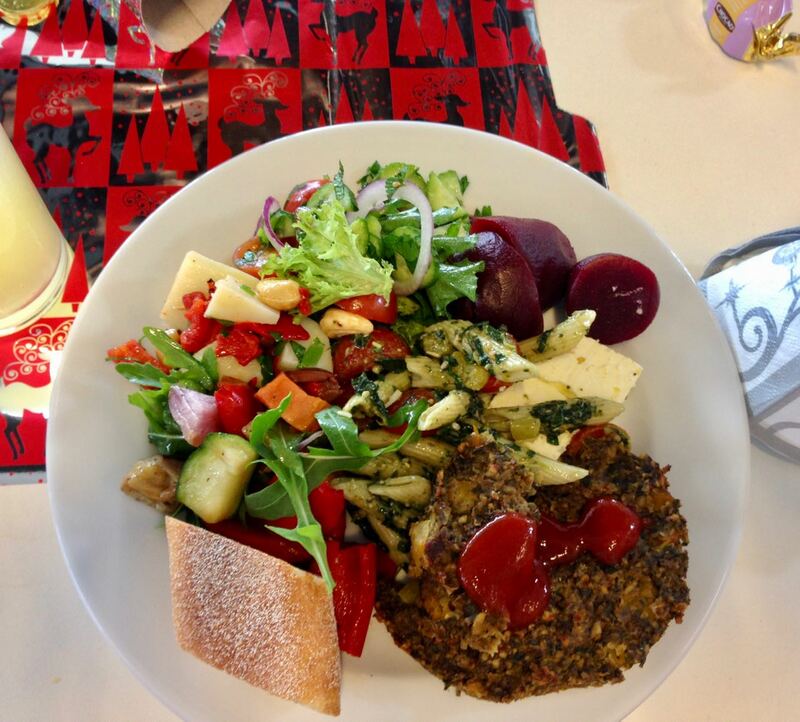 We also had our departmental Christmas lunch this week. Yes there has been a lot of eating out lately with work. There were lots of good salads and black forest cake for dessert. Unfortunately the bureaucracy decreed that there would be no frisbees on the oval by the pavillion where we were eating. But what do you expect of a workplace where the costs of corridors is a talking point! 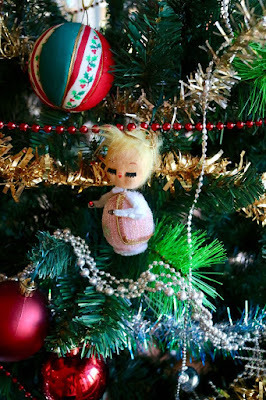 The day after, we went to my parents to help decorate the tree. I was enjoying it until my camera stopped working. I felt pretty silly when I took it to the camera shop and they said it was just a full memory card. I also was a bit annoyed that there was no clear sign of this on the camera (that I bought last year and have been filling the one memory card since) and not clear diagram of what all the numbers on the display mean if you look up the instruction manual. Anyway crisis over. So you see it has been a crazy busy time and the next few days will continue to be crazy. 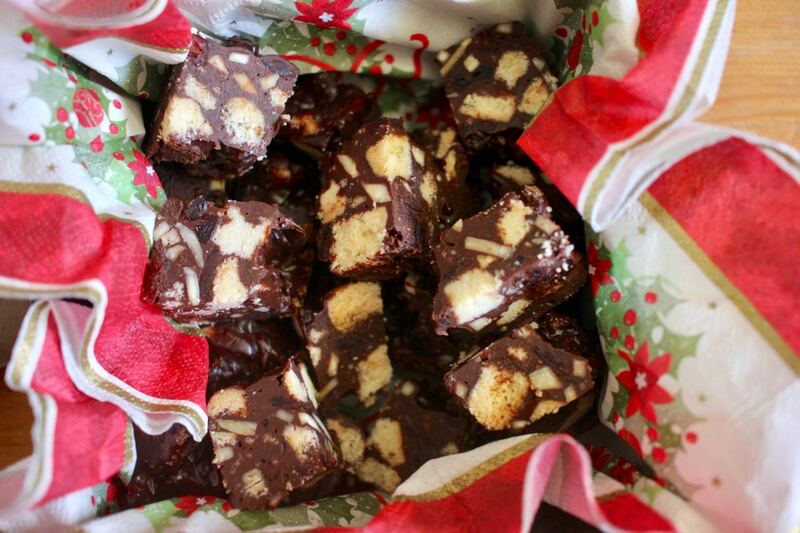 If you want an easy last minute festive gift for adults, I highly recommend this fudge. It is pretty adaptable to different liquors or add ins. I hope to be back before Christmas with a few more festive photos. Hope your holiday preparations are going well. Line a 15cm square tin. Break up or cut shortbread into chunks. Measure out cranberries and almonds (because you want to be prepared to mix them in before chocolate mixture thickens). Gently melt chocolate, condensed milk, Baileys and butter. Mix in shortbread, cranberries and slivered almonds. Scrape into prepared tin and use the back of a spoon to smooth down the mixture into the tin. Chill until firm - I did this overnight. Slice into small chunks - I sliced mine 6 x 6 so I had 36 pieces. Wipe knife occasionally and dry if you want your pieces to look neat when you slice them. NOTES: I used Lindt chocolate - 100g of 78% dark chocolate and 100g of sea salt dark chocolate. 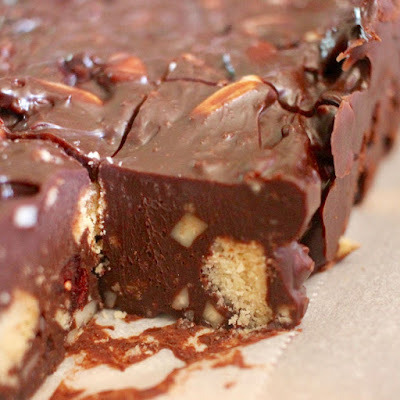 This fudge is as rich as the chocolate you use. I also used margarine rather than butter. I didn't measure it very precisely, hence calling for a dessertspoon of butter. Feel free to substitute the liquor of your choice or different add-ins. I probably could have had some more add-ins but I liked having lots of fudge around them. 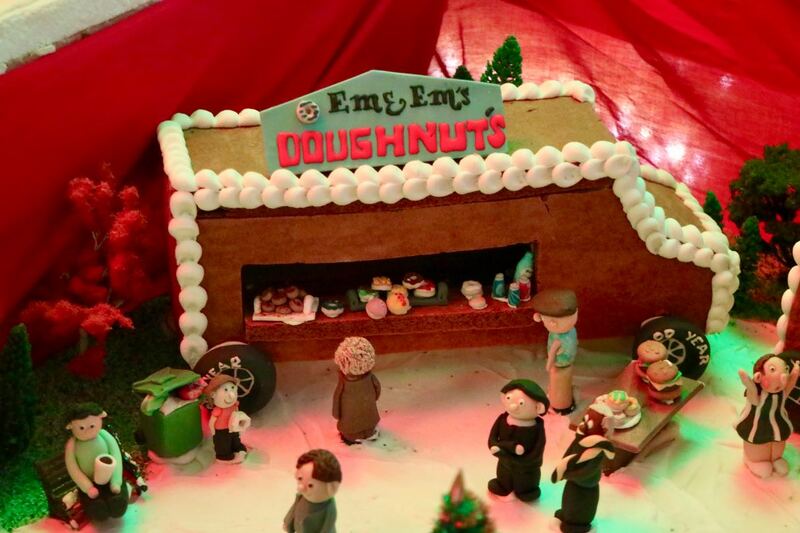 Last night Sylvia asked if the smell of gingerbread or a real pine Christmas tree was better. I said she was lucky to have both in the house. We had been baking gingerbread biscuits for her class Christmas party. Gingerbread has been her thing lately. (All Christmas is her thing actually.) 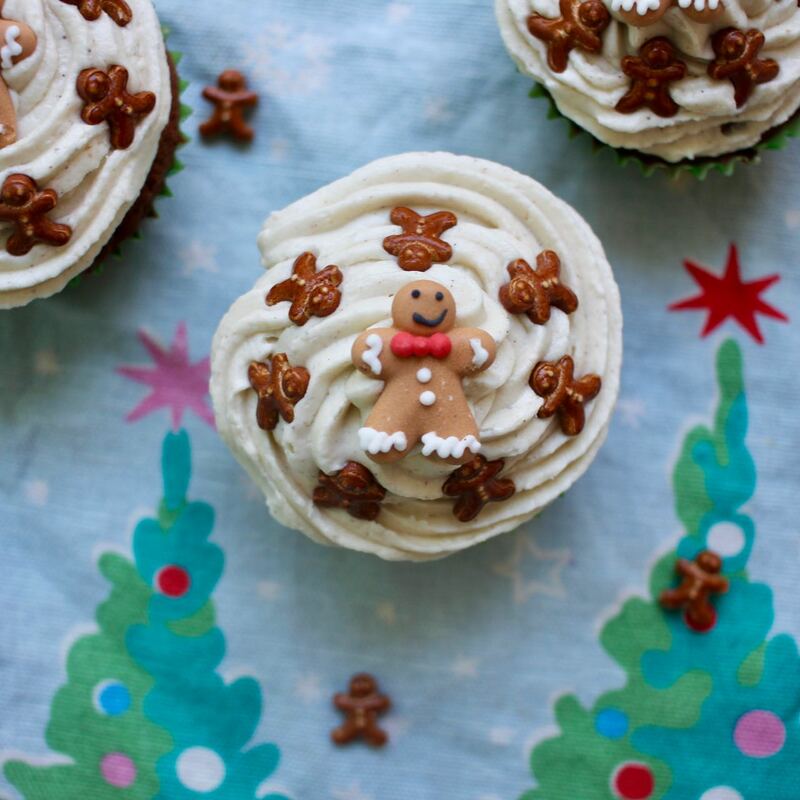 She spied some really cute gingerbread sprinkles in the shops so we baked gingerbread cupcakes a week or so ago just to decorate with them. As I have previously mentioned, it has been pretty crazy this festive season. As well as the usual tree decorating, Christmas lighting ogling, carols services and play dates, we had two huge back to back events at work last week. At the same time my computer broke down at home. I missed it a lot. But there was also a lot of freedom in not being online as much. 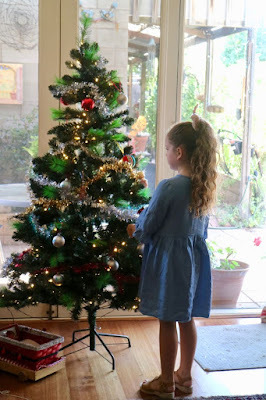 We made them to take to a local carols service to attend in lieu of the one that was cancelled the previous weekend. Sylvia packaged up the cupcakes very nicely but when we took them out at the carols, they were a little mis-shapen. As Sylvia has been quite taken by gingerbread this year, she has asked me to share a few gingerbread photos. It is just a small part of the gingerbread in her life lately. 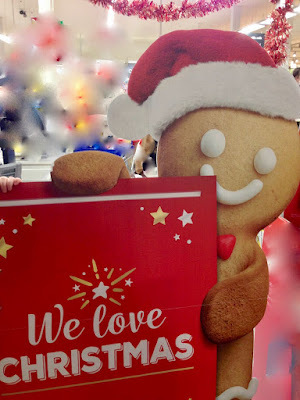 Here is the gingerbread advertising at Coles supermarket. 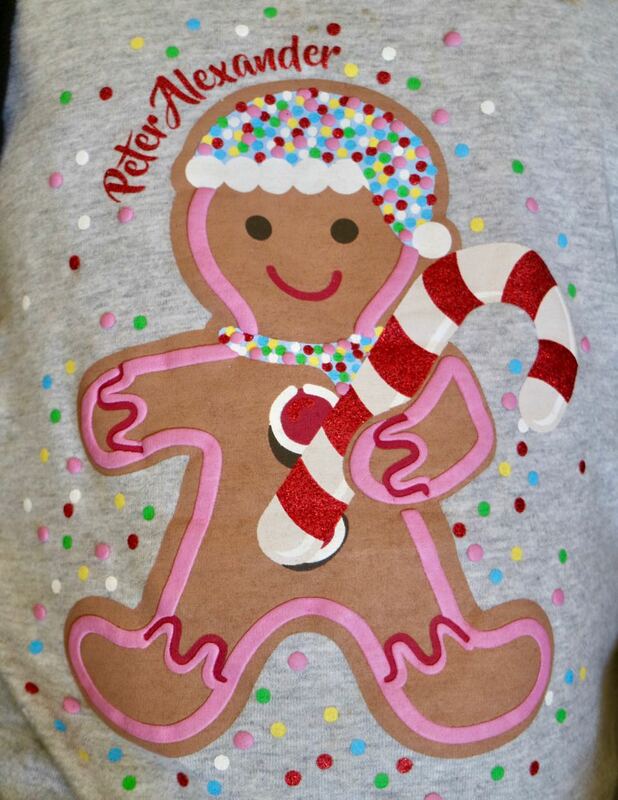 These are Sylvia's gingerbread pyjamas. A gingerbread man from Ferguson Plarre bakery. 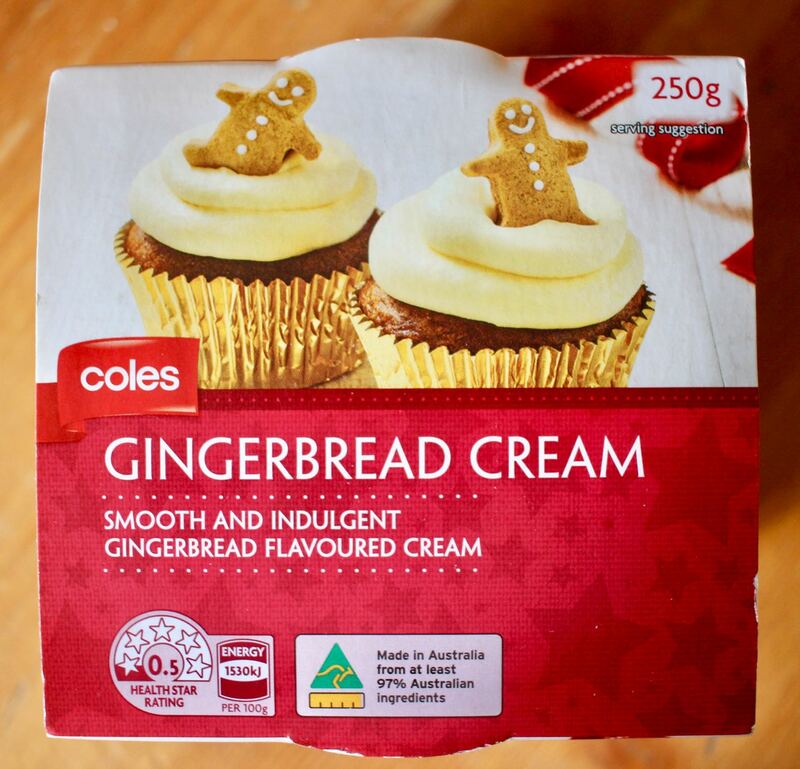 Gingerbread cream that Sylvia got me to buy. E says it is like brandy butter without the brandy. 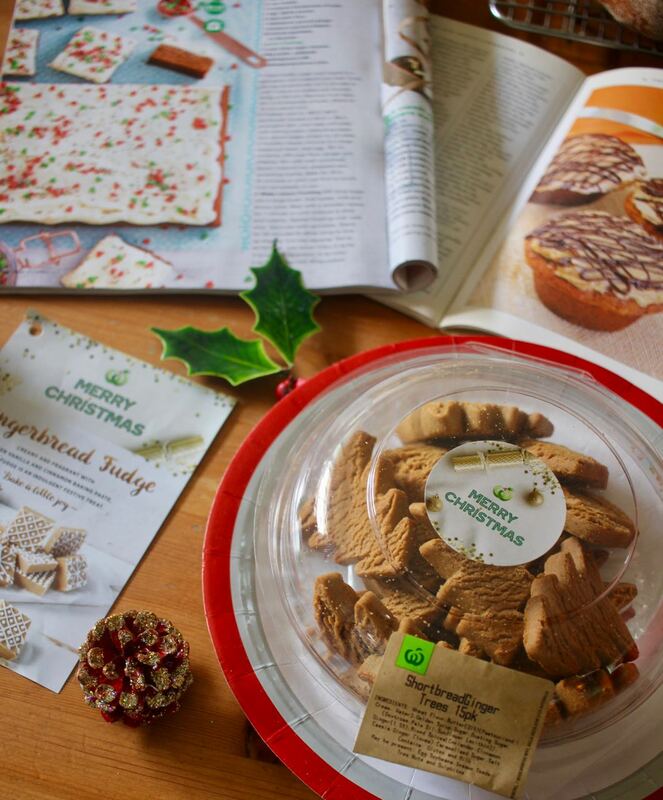 Gingerbread recipes and a packet of gingerbread shortbread that Syliva rejected but E is enjoying. 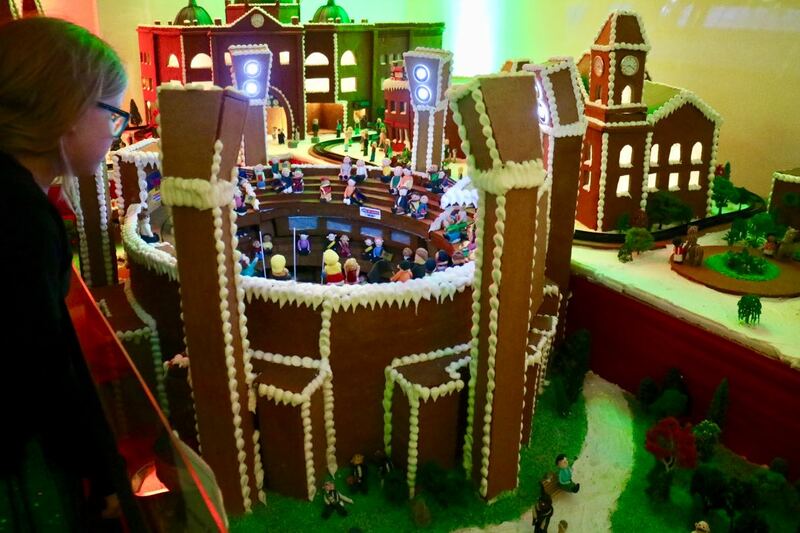 Finally we saw the gingerbread village in the Melbourne Town Hall tonight. It was great with a few new buildings such as Flinders Street Station (above). I hope to find time for some more Christmas posts soon! Lots to share but so little time. Mix dry ingredients in a large mixing bowl. Melt treacle and butter together. Mix with remaining wet ingredients and fold into dry ingredients. Spoon into lined muffin trays. Bake at 200 C for 20-25 minutes until a skewer comes out clean when inserted in the middle. Cool on a wire rack. NOTES: Our cupcakes were dairy free because we used dairy free margarine and instead of buttermilk I mixed soy milk with a tsp of cider vinegar and set it aside to curdle at the start. Icing and sprinkles are optional. We iced our cupcakes with buttermilk but I would have preferred a lemony cream cheese frosting if I had been better organised.